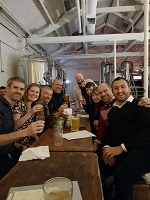 We held our 2018 Christmas party at one of Birmingham’s many new microbreweries, Dig Brew Co. in Digbeth. The evening started with a beer from their selection, all brewed on the premises, then Dave, the brewer, showed us around the facilities and explained the whole process to us. He let us try samples of the beers at different stages of the process, some of which were still warm from fermentation. More beer samples followed, together with artisan pizzas, and we ended the night on the dance floor. As always, it was a lovely opportunity to speak to other local linguists and, on this occasion, to get into the party mood ready for Christmas. Join the Midlands Network for a tour of a local microbrewery followed by pizza and, of course, beer. The cost of £20 includes a beer on arrival, a tour of the brewery, a tasting session of beers in production and finished products from the bar, and another beer with a pizza for each person.